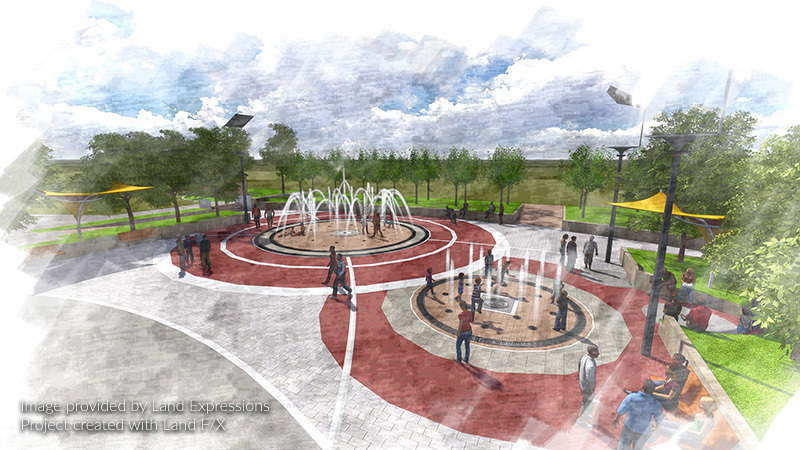 Planting F/X is landscape architecture software that adapts AutoCAD to the needs of your profession. 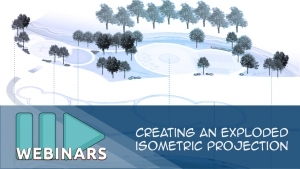 Design faster, with 100 percent accuracy, while still working within the CAD environment. built right into your CAD platform. 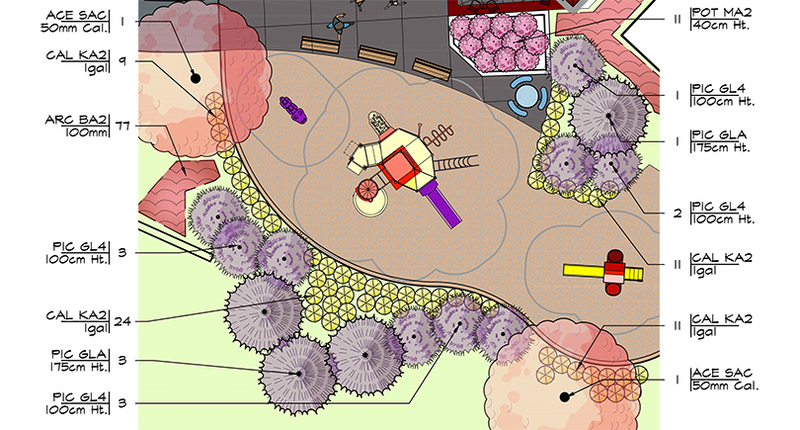 Developed by landscape architects for landscape architects, our planting design plugin works within AutoCAD and SketchUp. 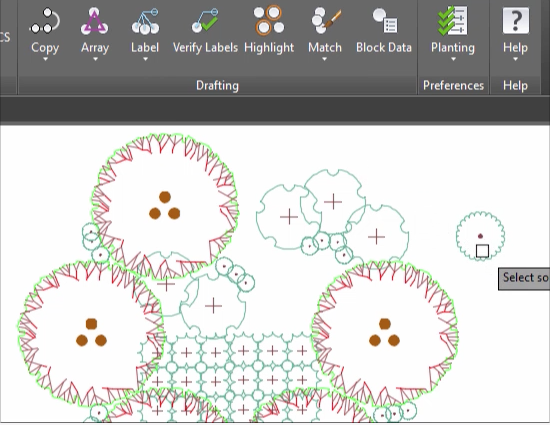 With just a few clicks, place plants as “smart” blocks and hatches embedded with all the data you need. 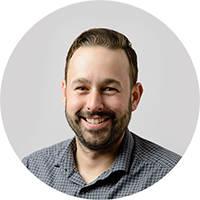 We automate all your tedious and error-prone tasks – like error checking, counting plants, labeling, and scheduling – and make them available in easily accessible dialog boxes within CAD. And because Planting F/X doesn’t use Proxy Objects, you can share drawings with consultants who don’t have Planting F/X, allowing them to see all your linework and objects instantly. 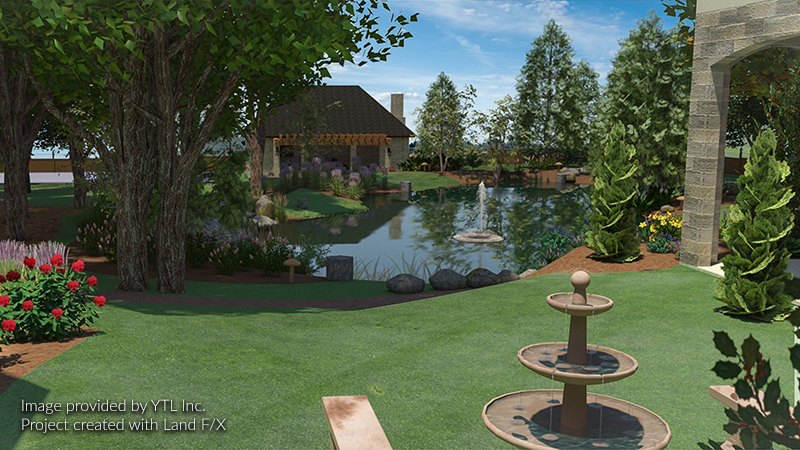 Our latest client–inspired planting features. Users like you have made Planting F/X what it is today! Each week, we produce a new Power Tip video showing off tools and techniques suggested by Planting F/X users. 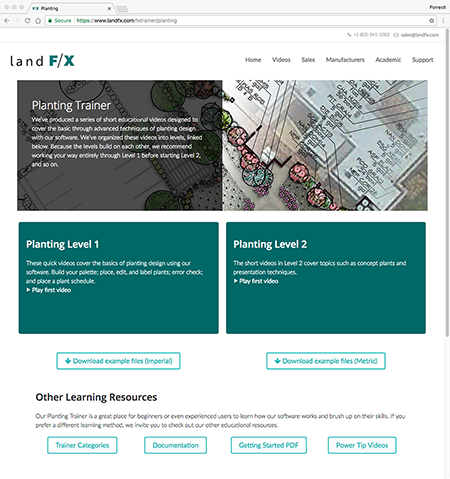 Watch these brief but informative educational videos to see some of our greatest planting features in action – and add efficiency and speed to your workflow. Is it customizable? Count on it! 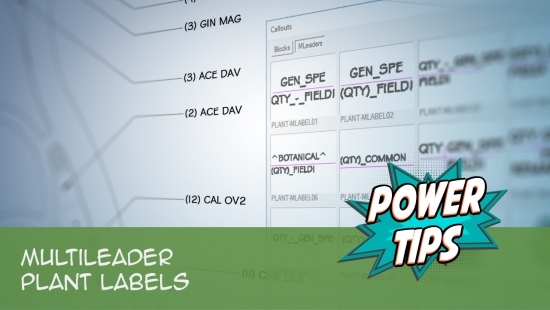 Customize your plant symbols, label styles, leaders, layer and line colors, fonts, title blocks, plotting preferences – you name it. We make it easy to apply your standards to the entire design process, from drafting to presentation to construction documents. Automation is great, but can you still use your own symbols, callout styles, and CAD standards? You bet. It's as easy as clicking this button and then clicking your block. It’s instantly saved into the system, ready to be placed as a smart block. Use our Preferences screens to customize every layer and every color, and dial in your text settings. But that’s just the beginning. Customize your plant codes, callout leader styles, number styles, and currency symbols for cost estimates. 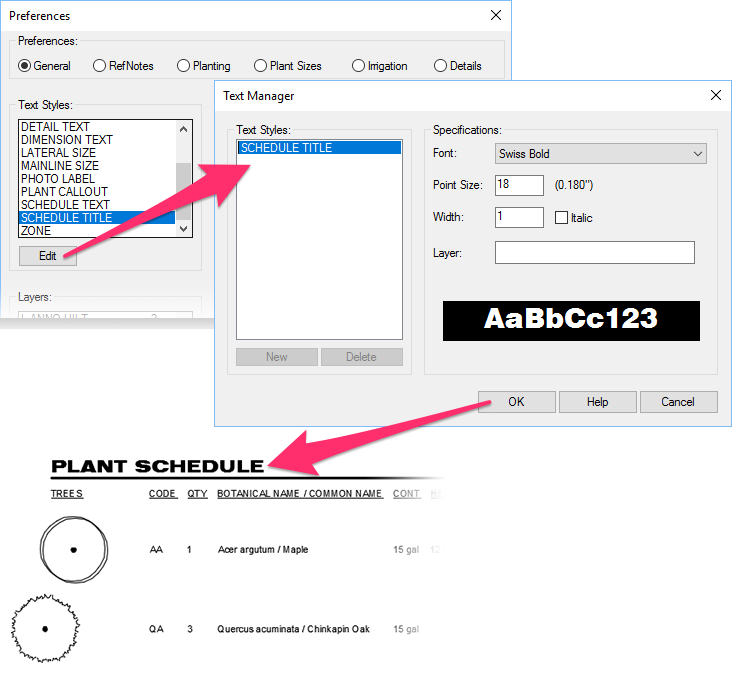 Create custom columns for your plant schedules, choose to label in Model Space or Paper Space … and much more. Your Planting F/X installation comes with a set of default Text Styles. Each style applies your chosen standards to specific applications of text in your drawings - like plant labels and schedule text. Set each Text Style to your chosen font, point size, width, and more. 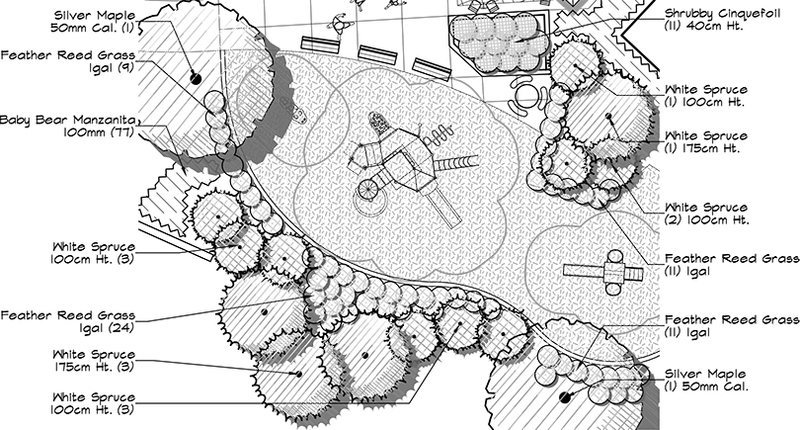 We don’t just give you thousands of plant and site amenity symbol blocks – we also give you the source block drawings. That means you can easily edit any of our plant symbols by opening and editing the DWG file that contains the linework for that symbol. Want to use your own symbols? It’s a snap. Just draw them and use our Save Block tool. 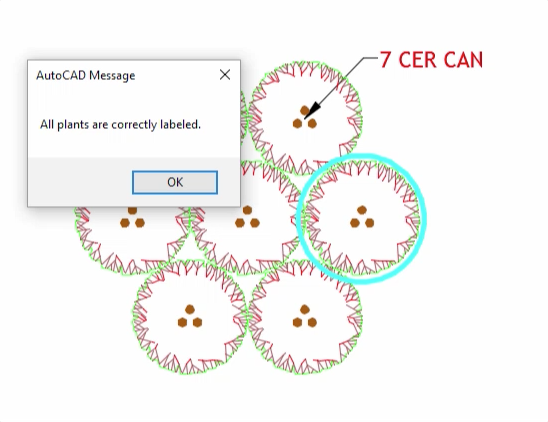 Your plant symbol is saved right into our software, along with a thumbnail slide, for easy viewing and access from within a dialog box in CAD. Like our plant symbols, our plant label styles are blocks sourced from DWG drawings that we provide with your installation – one for the left version of a label, and one for the right. You’re free to edit these source blocks to give our default label styles exactly the look you want. Save them, and they’ll be available for your use – also from a CAD dialog box. We provide a wide variety of hatch patterns to represent your groundcovers and hardscaping areas. 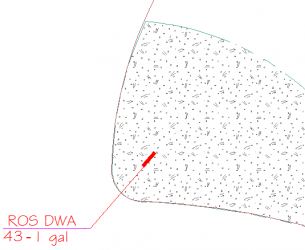 Have your own hatch pattern you want to use? 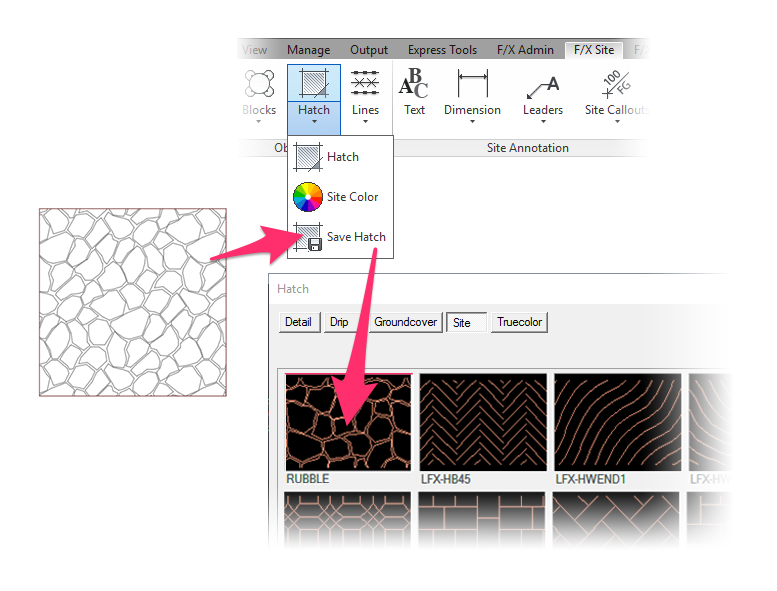 Our Save Hatch tool allows you to access your hatch from – you guessed it – a CAD dialog box. Layers and layer settings are the most basic elements of customization in CAD. 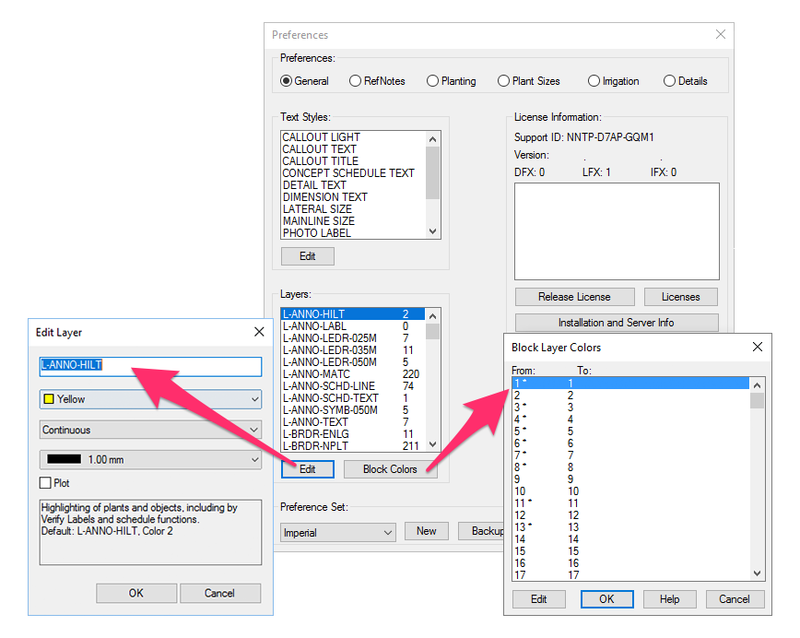 We make it easy to control your layer settings. 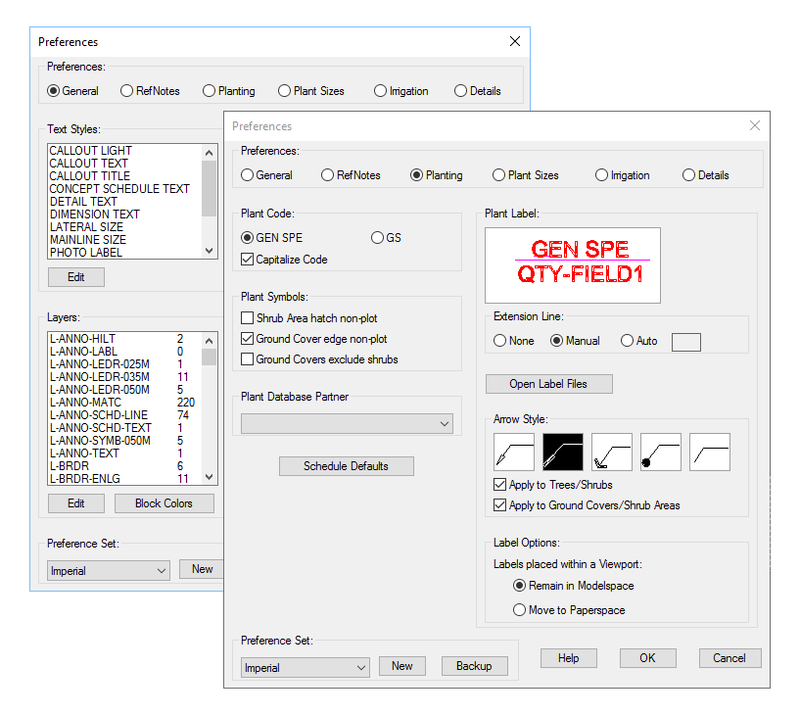 Our General Preferences screen includes an Edit button that allows you to revise the name, color, linetype, and lineweight of each of your layers. 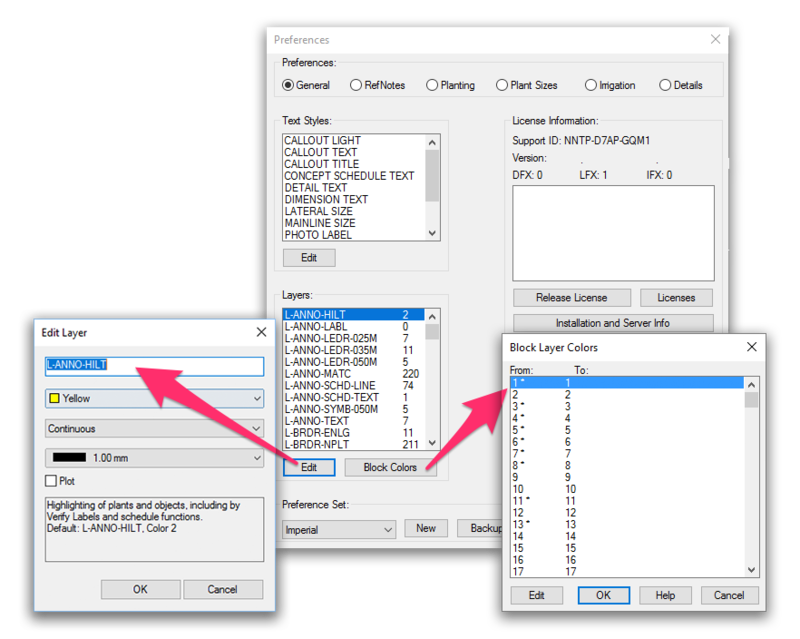 It also includes a Block Colors button that allows you to customize all 255 colors used by AutoCAD as index colors for plotting. Edit each color that conflicts with your office standards, and you’ll be sure to draw and plot exactly how you want. Extensive database of trees, shrubs, and groundcovers. 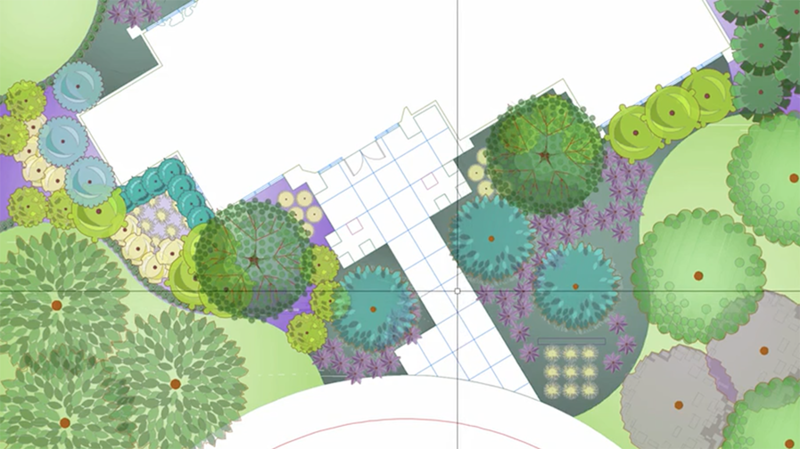 Create your virtual plant palette from a list of more than 20,000 plants while still working in AutoCAD. Our searchable plant library includes practically every genus, species, and variety you can think of. Don’t see it? You can add it. Need more information? 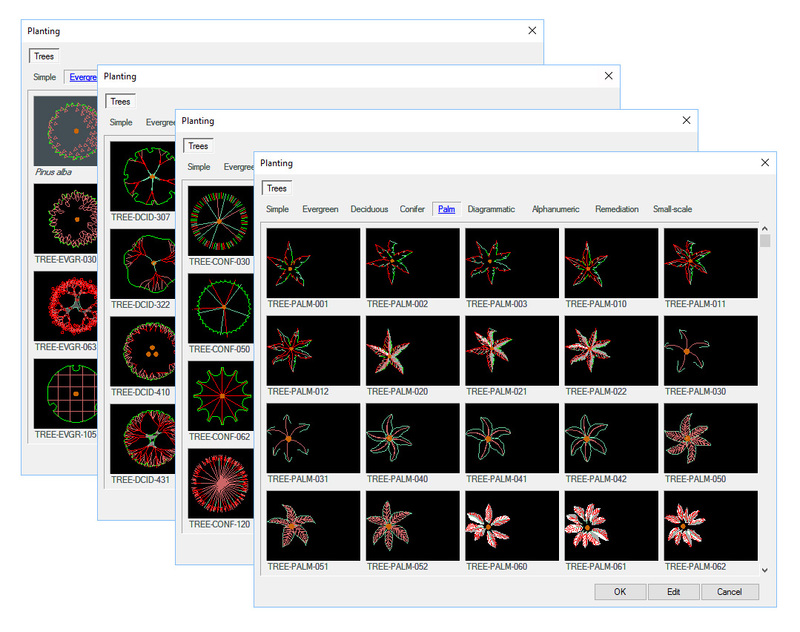 Wiki-based plant data is built right into the software! 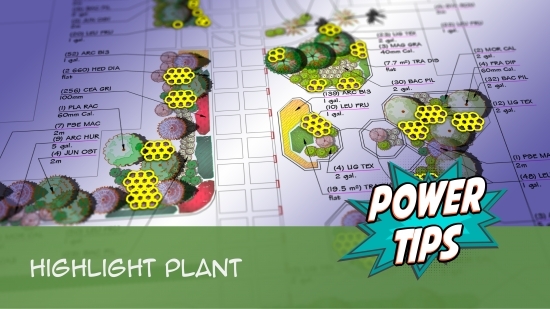 The real power of Planting F/X lies in our extensive collection of virtual plants. Any user can add any plant variety – including climate and character data – to our wiki-style database. Don’t worry; our staff landscape architects review every submission for accuracy. After approval, each added plant is available for all users worldwide, allowing the community of Planting F/X users to help and be helped by each other. Here’s how it works: Pick a plant genus, species, and variety from our vast database of trees, shrubs, and groundcovers. Don't see the plant you need? You can add it and use it right away. We'll see the new plant and add it for everybody else too! Add your plant to your palette with a click. All plants in your palette are consolidated into a single dialog box, organized by four plant categories – Trees, Shrubs, Shrub Areas, and Groundcovers. The plants in each category are alphabetized by genus, allowing you to find each one quickly when you want to edit or place it. Once a plant is in your palette, you can assign it with data. What does “data” mean in this context? It’s any information you want to communicate to your client, employer, or contractor about that plant, from width and height to rootball size, per-unit cost, water usage, and, if you want, tons of other specific info about that plant – growth rate, sun or shade needs, optimal soil, and more. These stats are all wiki-based for each plant, which gives you the opportunity to educate and be educated by the entire community of Planting F/X users. 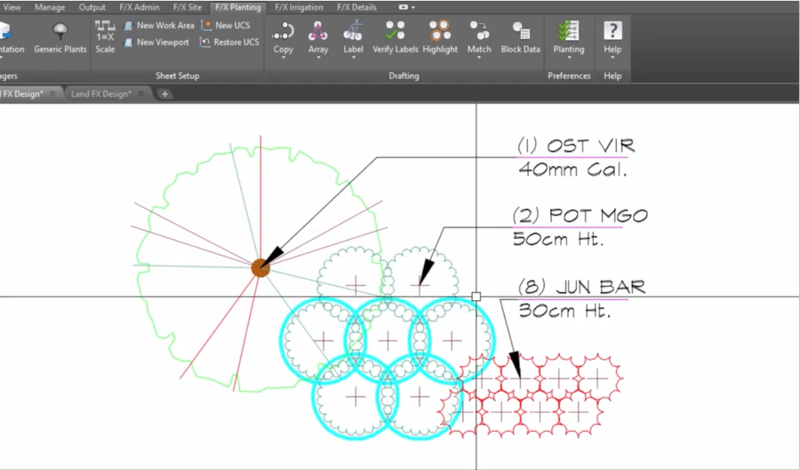 Now it’s time to choose an AutoCAD block that will represent your plant in your drawing. 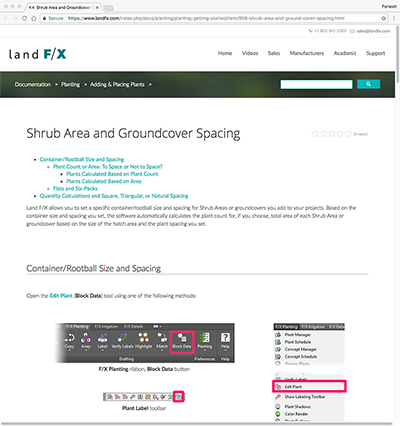 Your Planting F/X installation comes with an extensive library of thousands upon thousands of plant symbol blocks for trees or shrubs, and hatches for groundcovers. 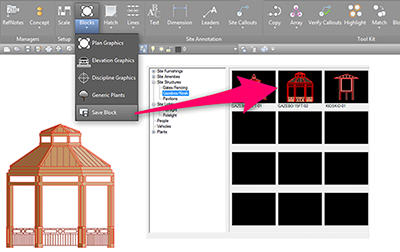 Once you’ve tied a symbol to a plant, it won’t just represent that plant variety in your planting plan – it will be embedded with all the data you’ve assigned to that plant. In other words, it will be a “smart” block. So many ways to place plants! Pick your plant, and click to place it. It’s that simple. Want an even quicker option? Our specialized tools give you numerous methods for placing multiple plants in one go. 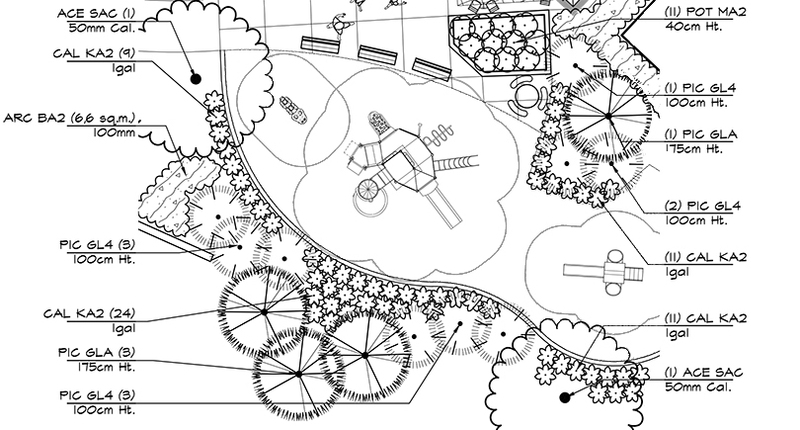 We make it unbelievably easy to place plants in your drawing. Just pick a plant, and click to place it. Fill a closed polyline with a groundcover hatch instantly – or draw your groundcover area on the fly. Those are the basics, but we offer much, much more. 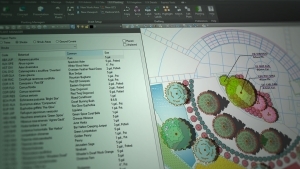 You’ll have enough creative and efficient ways to place plants to make CAD-based planting design feel like a landscape architecture video game. 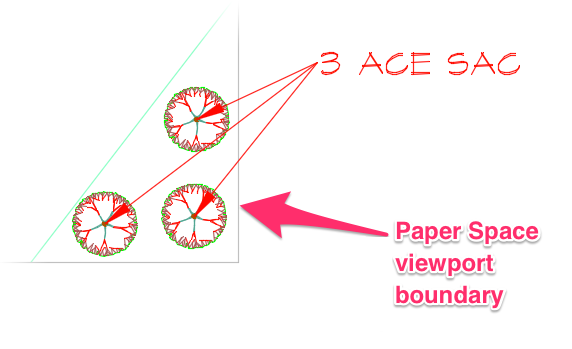 Instantly draw a line or arc of trees or shrubs, or snap a row of plants to an existing polyline in your drawing. First set a specific spacing pattern between the plants, including the exact number of feet or meters between them. Then place a uniform row of plants. 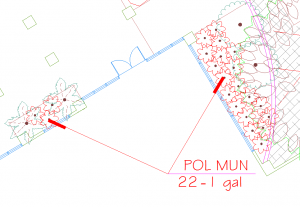 Select a polyline in your drawing, such as the border of a pathway or planter. Boom! A perfect row of plants is snapped exactly to that polyline. Drag your cursor in any direction. A line of plants will follow, with the exact spacing you set. 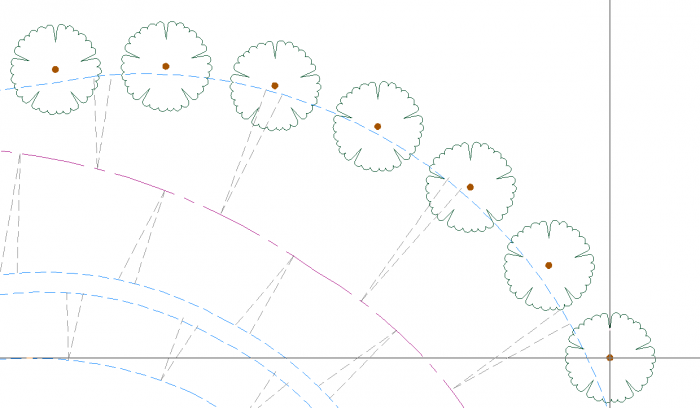 Draw an arc, set the midpoint, and place a precisely spaced arc of plants. “Paint” several plants at a time across large areas of your drawing with just a sweep of the mouse. First, place the tree or shrub of your choice. Then type T (for paint). Paint Mode is engaged! You can now move your mouse around the area you want to fill with plants. 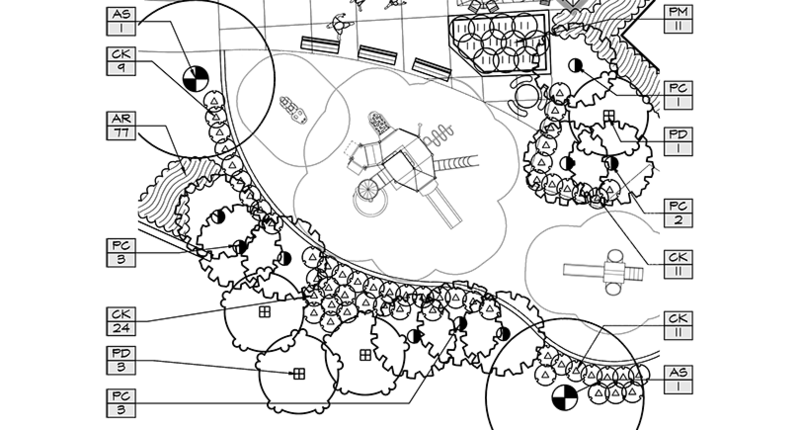 The trees or shrubs will automatically fill the “painted” area in a mathematically perfect triangular pattern. With Paint Mode, you can also control the exact angle of the plant pattern you “paint.” Just type X (for “Xhair”) to snap the cursor crosshairs to the angle of your choice. 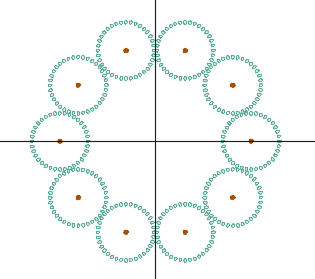 You can click to set the angle, type the angle in degrees (such as 45), or click a polyline in your drawing to snap the angle to the same angle as that polyline. 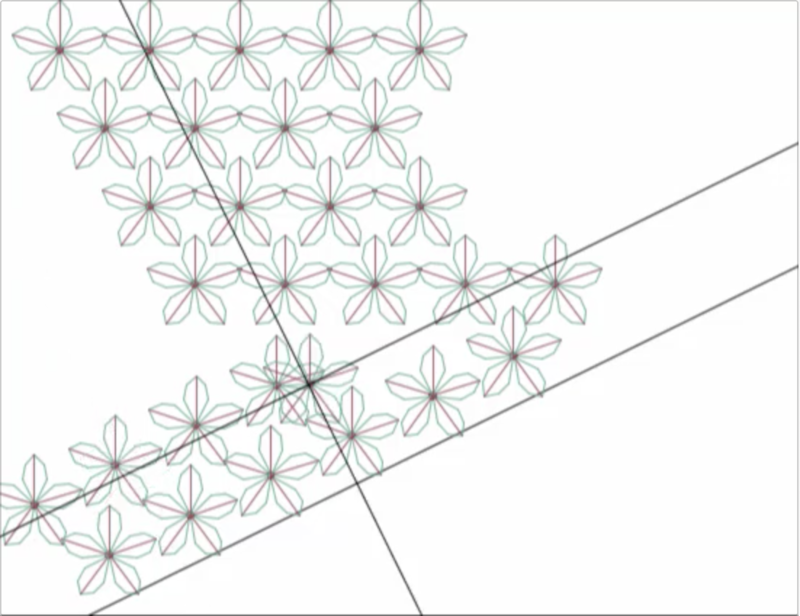 Copy any plant in your drawing, and place duplicates in a preset triangular or square pattern. You pick the spacing and direction, and it’s done. As with our other awesome tools for placing plants, you can snap the cursor crosshairs to a specific angle when setting your array. 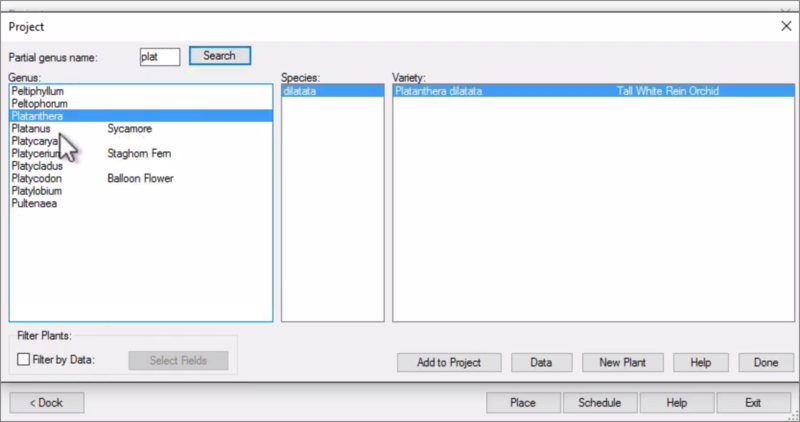 Change one plant into another, including all attached data, with a click. 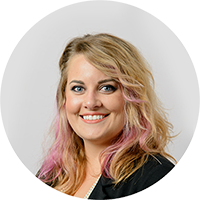 Match Properties is a great tool for switching out one plant for another to correct errors or fulfill revision requests. 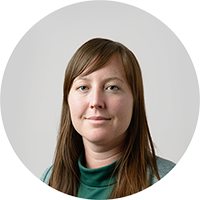 Grab a plant quickly, and copy it wherever you want – including its symbol and all attached data. Match Plant is a great way for copying and pasting trees and shrubs, as well as grabbing a groundcover and applying it quickly to any closed polyline area. Where to start? This awesome tool combines a ton of planting features into one, with the help of on-the-fly single-key keyboard commands. Set a number of plants to place, from 1 to 10. Toggle between plant patterns of the same number, plants in your palette, or the amount of space between plants. Rotate a group of plants for better fitting as you place them. 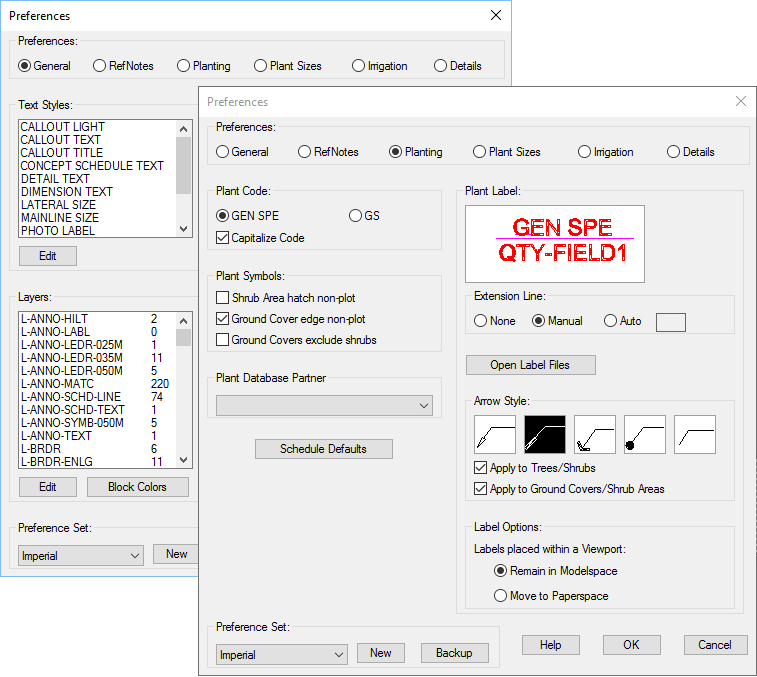 Snap plants to a crosshair angle, copy plants along a line or arc, or even enter our Paint Mode tool. It’s a self-contained arsenal of planting tools. 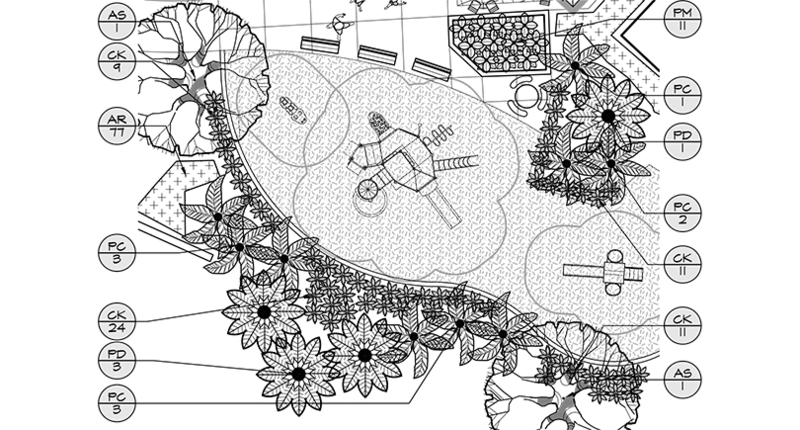 As a landscape architect, you’re intimately familiar with both rectangular and triangular plant spacing – as well as the advantages and challenges inherent in both. Rectangular spacing provides a uniform look (and might be required by some clients), but this pattern can also look contrived and leave too much space between plants. Triangular spacing is a bit more natural looking, but it can also drive up costs by requiring an excessive number of plants. 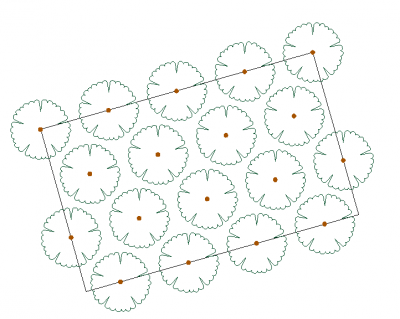 That’s why we threw some serious mathematics at the problem and developed the planting array we’ve dubbed “Natural Spacing.” Applied automatically to our groundcover hatches, Natural Spacing creates an array pattern that’s 10% less than true triangular. The result is a more natural-looking pattern that requires fewer plants. It’s yet another way we’ve applied our industry knowledge and experience to make your job easier. Label individual plants, or several at a time, with just a click using our “smart” plant labeling tools. 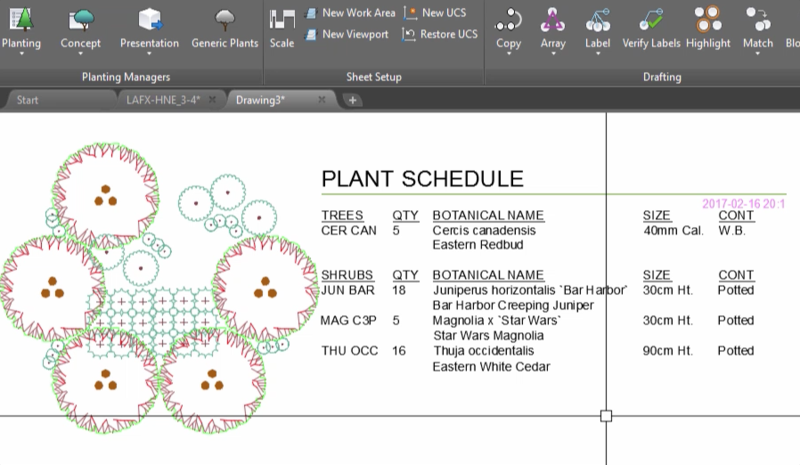 No landscape design software would be complete without a powerful plant labeling system. Ours is the fastest in the world. By calculating plant counts instantly and automatically, our labeling tools offer a level of time saving that’s just not available anywhere else. 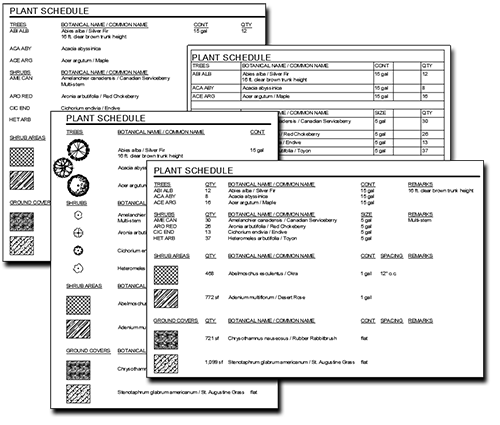 Plant labeling is an imperative part of the construction document phase. We make it infinitely faster and completely accurate. Think about the alternative: counting plants by hand and putting in a callout that reflects that number. For one group of plants, it might not big deal. Spread across hundreds of plants in multiple areas across an entire plan, it’s all but insurmountable. And what about revisions and error checking? Is your head spinning yet? 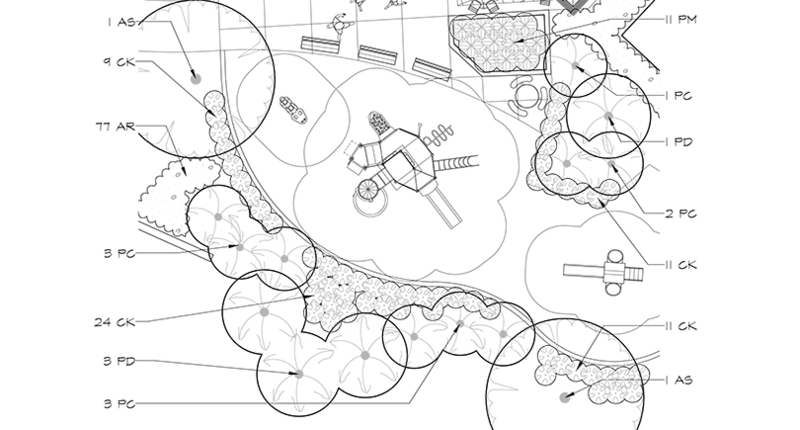 Why spend your time counting plants when you can spend that time designing a better plan? Call out an entire group of the same plant variety with one label. It’s as easy as selecting a plant and drawing a window around the plants you want to label. The window will only recognize the plant variety you selected, meaning you can label several plants at once without having to select them individually. Set down the callout, place as many leaders as you want, and your plants are called out. Connect the dots between several plants of the same variety, placing a single label that connects them all. It’s a simple, clean way to label a large number of plants that’s clear enough for the contractor to understand. This labeling tool operates on the same principal as Label by Connecting Line, except it uses arcs instead of lines. 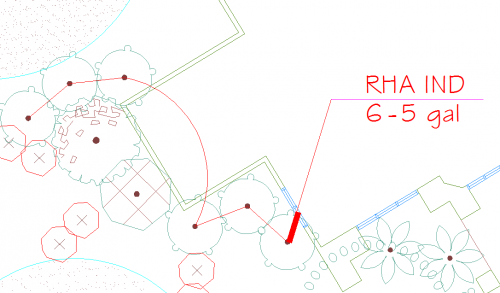 You can easily control the paths of the arcs, preventing confusion by avoiding intersections with other plant varieties. Labeling a single plant is the simplest of our labeling methods. Just select a plant and place the label. Labeling a groundcover hatch? 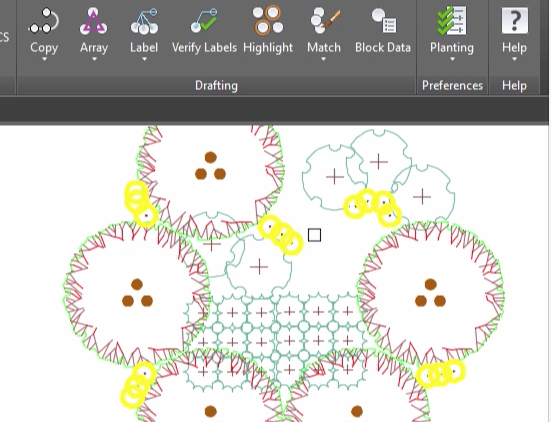 This labeling tool will automatically calculate the plant count or square footage based on the spacing you’ve set – even though you can’t even see the individual plants. Labeling plants in Paper Space, with the labels extending outside the viewport, is the preferred labeling method of many designers who want to clean up their plan, or who simply prefer the look. 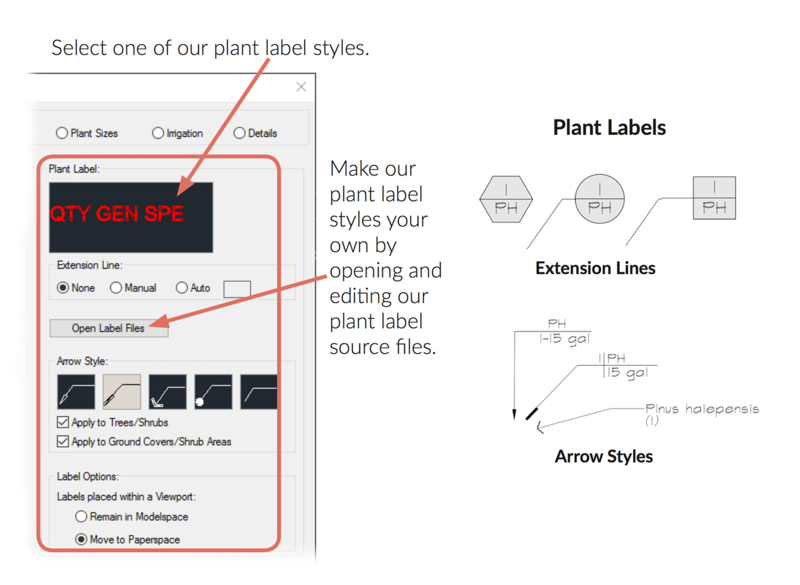 Our labeling tools work just as well in Paper Space as they do in Model Space, giving you the choice to label how you want (or how your office requires you to label). Though technically a presentation tool, our Plant Photo Callout feature gives you the option of calling out a plant with a photo – right there in your design. Opening this tool and selecting a plant fires an automatic Web search for images of that plant. You can also browse to and place your own plant photos. Set the photo size, type a caption, and you’ve got yourself a vivid plant label. As an added bonus, Plant Photo Callout also works for site amenities and lighting equipment. You get every part of your plan exactly right on the first try … right? No judgments here. Even if you’ve placed and labeled all your plants correctly according to the original plan, clients and bosses change their minds, requiring revisions, recounts, and removals. For example, we make it easy to move plant labels. Need to clear the way for more plants or an unexpected pathway? With our help, you can move those labels out of the way without disassociating them from the plants they’re calling out. Your labels are back in the correct locations, and your plant counts are still valid. Click, click, done. And don’t forget our error-checking tools, like Verify Labels. A single button is all you need to ensure that all your plants are labeled correctly. 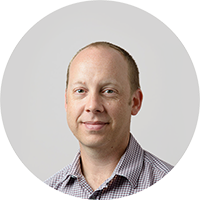 Don’t feel like scouring your entire plan over and over, only to have errors slip through to the construction phase? You’ll love Verify Labels. It’s 4:58, and you need to turn in your plan NOW! How do you ensure that your plants are tallied and labeled correctly (and still be home in time for dinner)? Use our error-checking tools, and never count by hand again. Why, oh why, would anyone ever want to count plants by hand? Aside from the sheer tedium, the worst part of manual error checking is the potential for miscalculation. 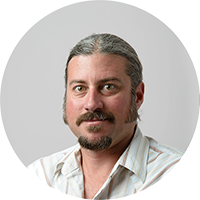 Our error-checking tools are like an assistant whose only job is to scan your design – as many times as you ask – and ensure that everything is 100% accurate. We’ll save you literally hundreds of hours. More than a decade in, and our Verify Labels tool is still Planting F/X users’ favorite button. Click it, and fix any labeling errors in seconds. What does Verify Labels help you fix? Any copied, unlabeled, and deleted plants. Anything it can’t fix automatically will be marked with a color-coded highlight for easy correction. Just find the bright highlights, and make the necessary corrections – no stress, no mistakes. This button will be your best friend. Need to find everywhere you’ve placed a certain plant? Use our Highlight Plant tool. Find one instance of that plant and click it. 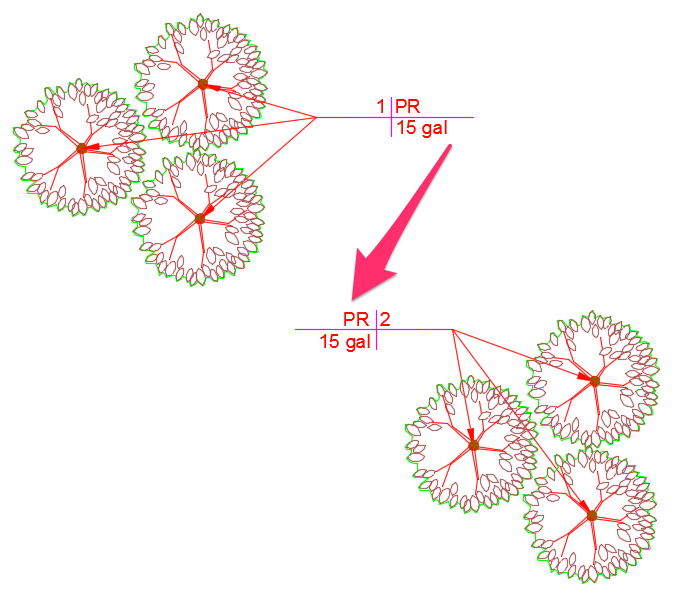 All plants of the same variety are instantly highlighted in your drawing, allowing you to locate or even select them all. By the way, it also works with all smart blocks, including site amenities and irrigation equipment. 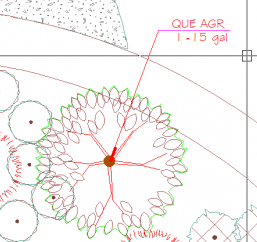 You painstakingly place a whole forest of Quercus acuminata, and the client decides they should all be Quercus agrifola instead. No need to pull up your roots – everything is oak-ay (get it?). Just use our handy Match Properties tool. Grab the variety you want, draw a selection window around all the trees you need to change, and the revision is made automatically, throughout the window. What if you just need to switch out a plant’s symbol, or change its cost, size, or any other pertinent information? Just use our Block Data tool. 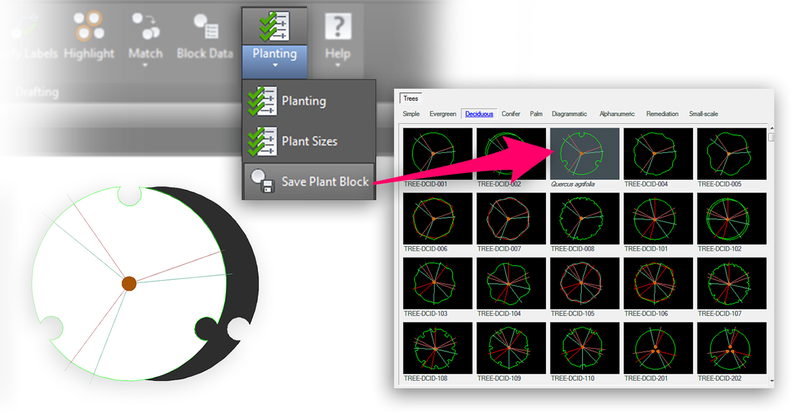 Click the plant symbol in your drawing, and you have access to all the info you need in dialog box. Make your changes, and close the box. Your edits will be applied to that plant everywhere you’ve placed it in your drawing. Make life easy for both yourself and the contractor! 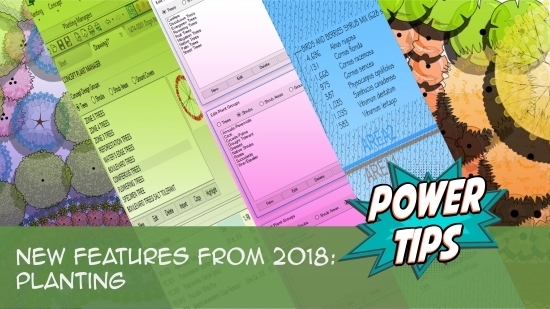 Instantly catalog your entire palette in a plant schedule that includes quantities, container sizes, costs, and as much – or as little – info you need to communicate. Say goodbye to manual calculations, and never count plant quantities or costs again. Place an accurate plant schedule that contains all the data you need – in just seconds. Click a button, and place an instant plant schedule. It’s that simple. Send your schedule to your drawing, or to a spreadsheet for further editing. Run a schedule on your entire palette or just a portion of your plan – even include plants in your Xrefs. Plus the data you include in your schedule is all under your control. List plant sizes, quantities, or costs – or don’t. It’s all up to you. List your plants by common or botanical name, or both. Include plant symbols or codes. 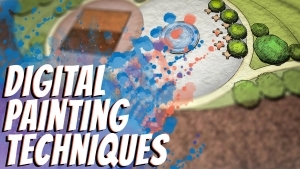 Make the settings uniform or completely different for trees, shrubs, and groundcovers. Then sort your plants in each category by code or by common or botanical name. Easily regenerate your schedule after revisions – that's how easy it is. 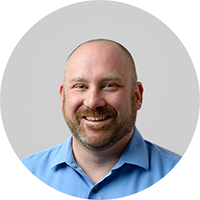 Say goodbye to all the headaches and frustration of manual scheduling. Give your plan a new level of vibrancy by clicking a button. We’ve created thousands of unique color plant symbols, and our library is constantly growing. Make a splash with your presentation, then dive back into construction mode in a flash. Time to present your design? Spice it up with our Color Render tool. We’ve created thousands of unique color plant symbols in our ever-expanding library. Choose from a wide variety of tree and shrub symbols, as well as colors and textures for your groundcovers and shrub areas. 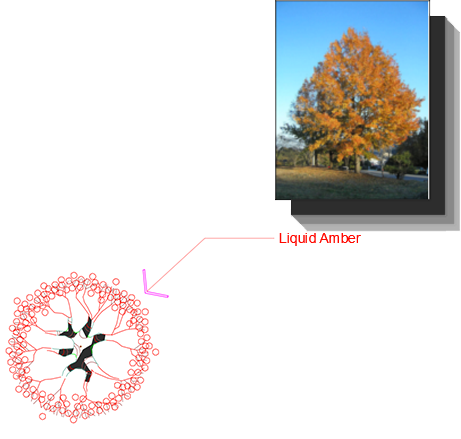 Select a symbol with multiple colors, interior foliage or linework, flowers, or multiple trunks. Our library also includes evergreens and conifers, palm trees, tropical shrubs, and vines. Then choose a color from anywhere on the prism. Turn your color symbols on and off with a single click, and fly seamlessly between presentation and construction documents. Who says color is just for plants? What about your site and hardscape plan? Our Site Color tool brings it alive. Select a color and hue, then apply it to a hardscape area or site amenity block. Create your own custom color wheels, and customize your color layers. 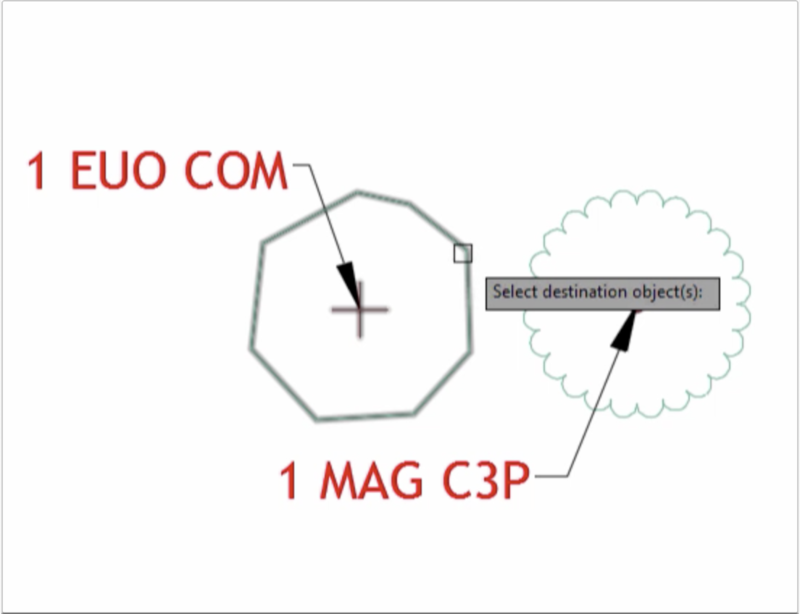 Add another dimension with our SketchUp Connection. Have you tried SketchUp? This 3D modeling application brings your designs to life. 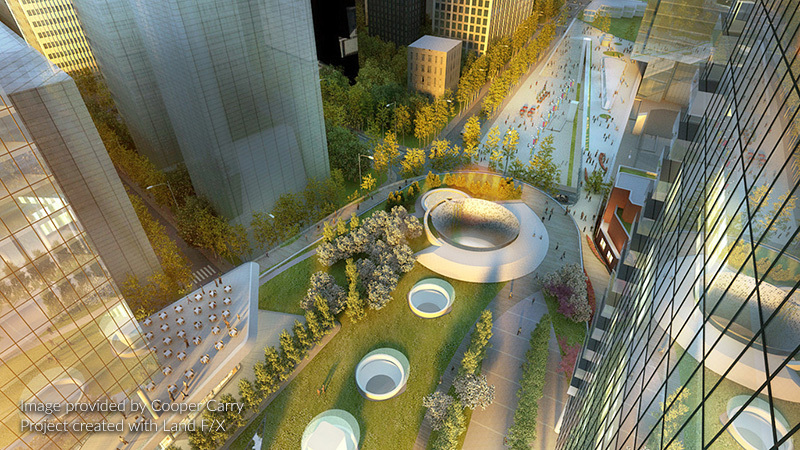 We’ve developed a seamless channel between CAD and 3D rendering. 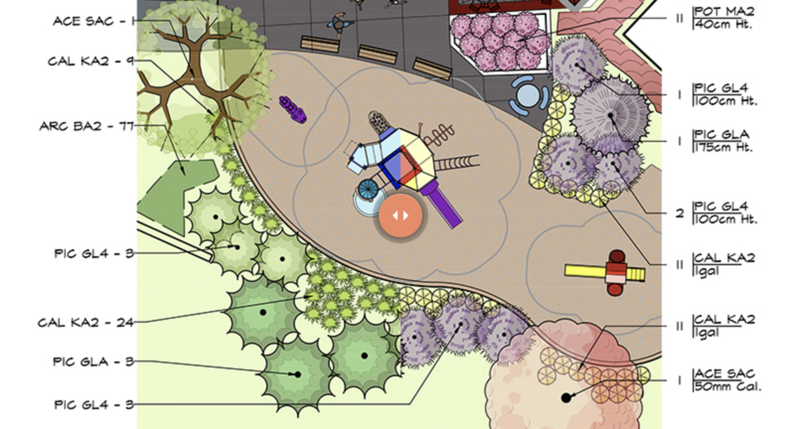 Included with your Planting F/X license, our SketchUp Connection maintains your exact plant palette, plant placements, and linework from CAD to SketchUp and back again. 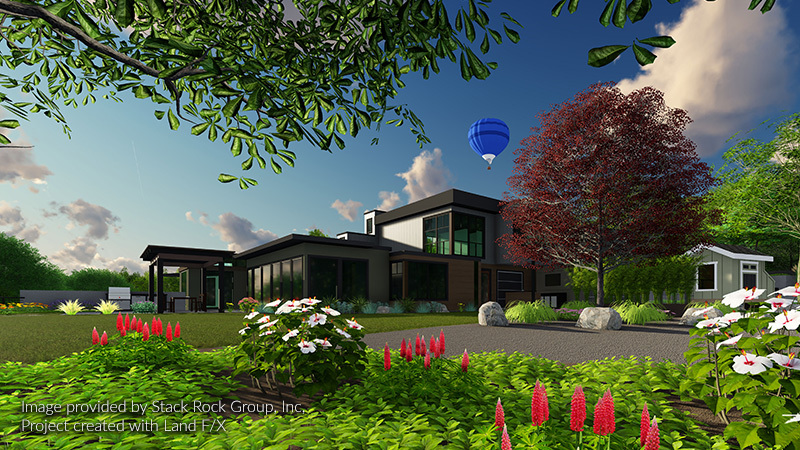 The images below have been provided by Planting F/X clients using our SketchUp plugin in conjunction with advanced rendering plugins such as Thea and Shaderlight. 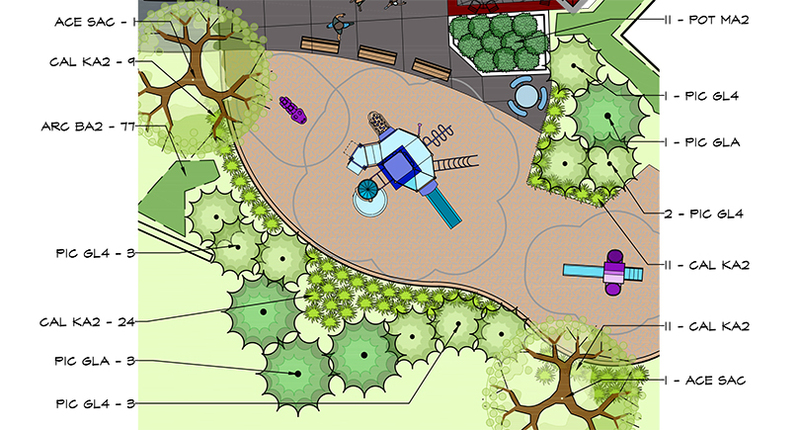 SketchUp is an ideal 3D platform for most landscape architects. 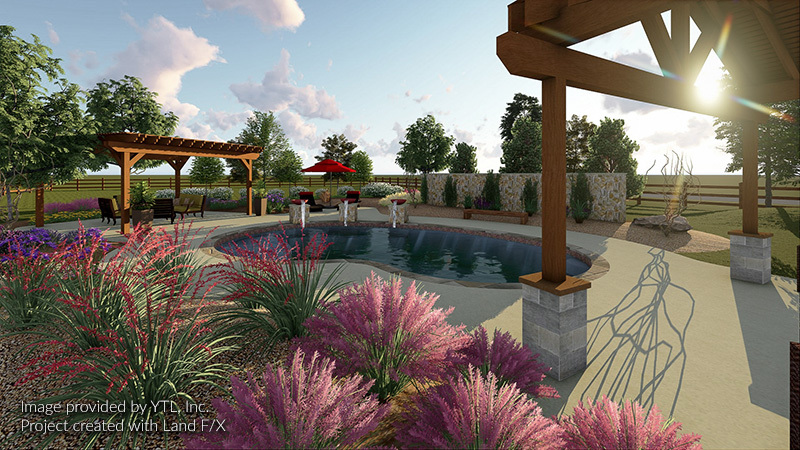 In fact, for 3D rendering, it blows AutoCAD out of the water. 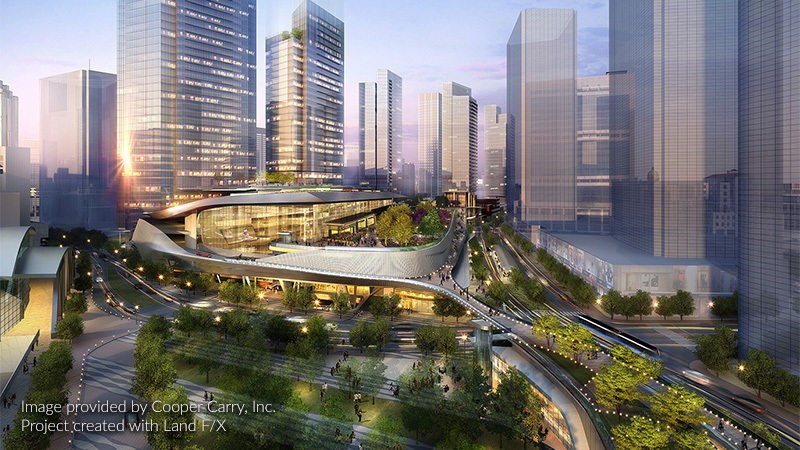 Plus it provides a great way to present a conceptual design early in the process. 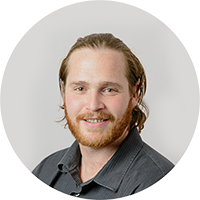 But the precision of AutoCAD and the ability to present your sites in plan view still makes it a superior platform for construction documents. Planting F/X connects these two valuable programs through the cloud to take advantage of the best parts of each. 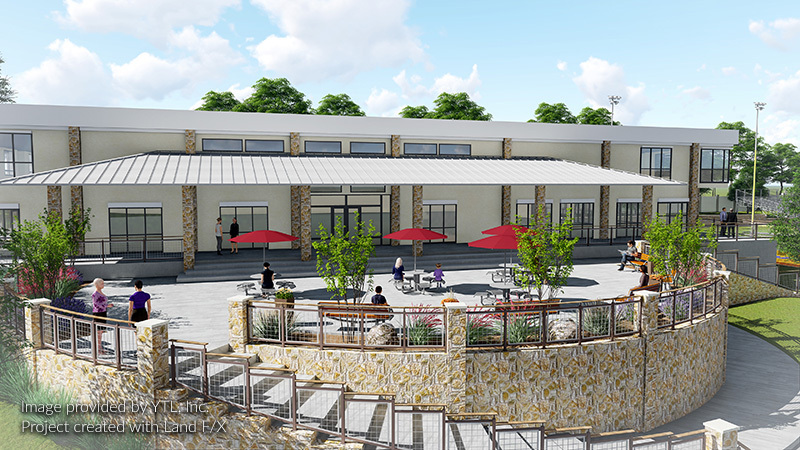 With the help of our SketchUp Connection tool, you can design in CAD and bring everything into a 3D SketchUp model. Need to make some changes while in SketchUp? 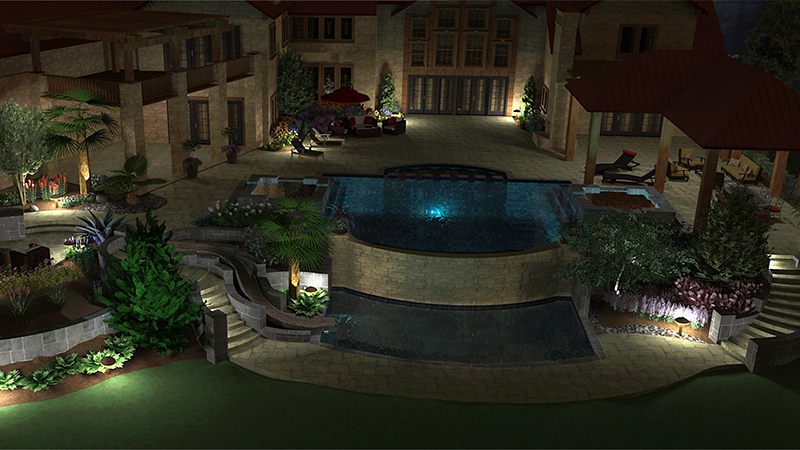 You can add plants and site amenities to your palette and place them in your model. Bring it all back to CAD, then back to SketchUp again. Linework, layers, and blocks fly back and forth, maintaining their positions. Blocks and hatches retain their data as well. We make it possible to jump between dimensions. Planting F/X is designed from the ground up to be a multi-user platform. 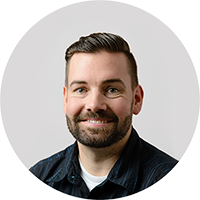 You can easily sync your Planting F/X content between every user in your office. Have multiple offices? Use our Cloud Data service to sync through the cloud.